Embossing techniques – I love how embossing can really add a punch to your project, without always adding more bulk! Most of us already know about dry embossing. That’s the technique where you use the Big Shot and an embossing folder, with the cardstock sandwiched in the middle of the embossing folder. Stampin’ Up! has 2 pages of embossing folders that you can SEE HERE, or check out pages 210-211 in your Annual Catalogue. You may not be familiar with our new 3D Dynamic Textures embossing folders, though! Last year, Stampin’ Up! introduced the Cable Knit and Hexagons 3D folders. Now there are 3 more – the Layered Leaves, Ruffled, and Pinewood Planks. The difference between these and the ‘regular’ embossing folders is the depth of the texture that they create. These folders are a lot thicker than the regular folders, so your Big Shot ‘sandwich’ is different, too. You only need to have, from bottom to top: Big Shot Platform, 3D embossing folder (with cardstock inside), then Standard Cutting Pad. You don’t need that bottom cutting pad – it makes the sandwich too thick to pass through the Big Shot. Isn’t this gorgeous? You can see how there are different depths of texture within the leaves. This adds such a wow to your project! Also, with these 3D folders, getting the best impression involves lightly spritzing both sides of your cardstock with water, before putting it inside you embossing folder. Doing this ensures that the cardstock fibres will flex, instead of tearing, during the embossing process. There are 2 ways you can heat emboss with the Heat Tool and Versamark Ink. If you want to use a coloured Embossing Powder, then simply ink up your stamp using just Versamark ink, stamp onto your cardstock, then cover with the coloured Embossing Powder. Shake off any excess powder, then heat set it, using your Heat Tool. If you’re quick, you can skip the Versamark ink – but you need to make sure that your Classic Ink pad is very ‘juicy’ – otherwise it will dry before you get the embossing powder onto it. Just ink the stamp in the Classic ink pad, then immediately – I mean, have your Clear Embossing Powder open and ready – cover the ink with the powder, then heat set. If you take too long, or your ink is not ‘wet’ enough, the embossing powder won’t stick. This technique was brand new to me! I had never heard of embossing just water before! 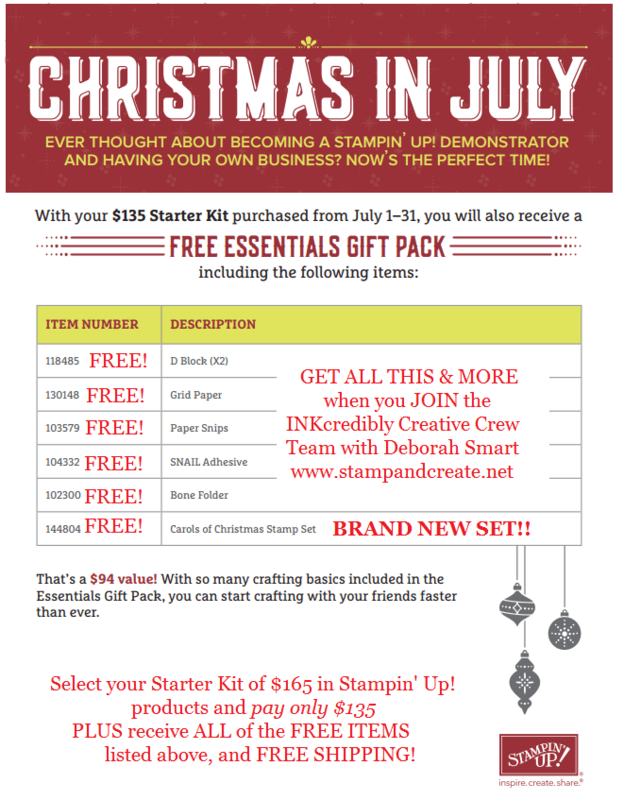 Watch the Stampin’ Up! video below, and see how Carrie Cudney from the Stampin’ Up! home office does it! Isn’t it fun to watch all the different techniques being shown? I love it when I learn something new! Speaking of new – Bonus Days are coming to an end soon, so get your orders in before July 31st!! You’ll receive an instant $6 Coupon Code for every $60 order (before tax/shipping), that you can redeem any time in August! If you really want in on the good stuff, join my team before July 31st and get a FREE Essentials Gift Pack worth $94!! Plus, you’ll get to pre-order from the upcoming Holiday Catalogue starting August 1st – one whole month before it goes ‘live’! Thanks, Buffy! I think SU! did a great job with their video. And who knew about embossing water??! !